I'm going to attempt entry into the upper division creative writing class at Davis next quarter... and what I have posted today will probably be one of my submissions. The title of my short story is "Yellow", and since I can't preface my story to the panel who will be judging my work for the class at Davis, I won't preface it too much here. A while ago I was inspired to record a memory. Unfortunately, the memory was dimmed because of the nearly two decades that have passed since it happened. And what happened probably wouldn't qualify as an event if judged by anyone else. But I allowed my imagination some range, and I gave myself the time to really delve into the recesses of my creative brain. What I came back with was a story that I wanted to tell. A glance at innocence when it is vulnerable and defensive, like a sea anenome. 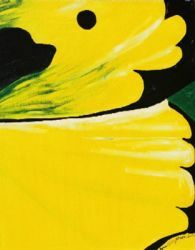 "Yellow" is one of my only short stories that I consider to be complete, and still I touch it up each time I read it. What I'd really love is some feedback. Amanda smelled like paste and oatmeal, and she wore her thick hair in one brown braid that hung down her neck and back to her waist. She was the girl in the corner, the one who no one wanted to sit next to. And because things didn't always quite make sense in her head, and because people laughed at her when she was wrong, she rarely answered questions in class. But her teacher, Mrs. O'Dell , asked Amanda the questions anyway. The Tuesday before school had begun that fall, an administrator had entered Mrs. O'Dell's fourth grade classroom. He told her that she would have Amanda in her class. He called it 'mainstreaming'. Don't coddle her. Don't favor her. Don't go out of your way to protect her. After the administrator left, Mrs. O'Dell sat on the floor near her desk, stapler in hand, and she cried a little, because everyone in the school knew Amanda. At lunch she ate alone at the end of a long, white table in the cafeteria. Every day her father, a large, quiet man with a dark, heavy beard, would pack a sandwich and juice in her My Little Pony lunchbox. No other kid in the fourth grade still carried a lunch box, but both Amanda and her father were oblivious to such things. And this became one more reason for her classmates to pick on her. Occasionally one of the older boys in the cafeteria would try to bounce a grape or a reject-flavored jellybean off her head, drawing laughter from everyone who saw. More than once she left the lunchroom crying. On sunny days Amanda would take her lunch out to the corner of the elementary school field, near the fence. When she was alone there wasn't anything to explain. Wednesday dawned bright and beautiful; it was an outside-lunch day. Amanda chewed her bologna sandwich quietly, staring at nothing. Then there was a swarm of little girls running past her, their t-shirts flapping, skinny legs pumping, hair streaming. Amanda flinched, almost dropping her sandwich. But the girls were off to her right, jumping like bright flowers in an almost-circle. Above them fluttered a big yellow butterfly. Amanda smiled because the moment was pretty. 'What are you looking at?!' yelled one of the girls. The rest of them laughed when Amanda jerked her eyes away, down to the ground. Back inside the classroom, one of the girls presented Mrs. O'Dell with a gift: the butterfly. It twittered prettily in her hands. Mrs. O'Dell smiled, delighted, and fawned over the gift and the giver while the rest of the class eagerly awaited a chance to see the butterfly, too. A lesson could be taught here, about metamorphosis or evolution or beauty, and so, as any good teacher would, Mrs. O'Dell began moving slowly between the tables, holding her hands out with the insect on display. Chaos was breaking out, kids climbed onto their desks, bolted from their chairs. Mrs. O'Dell was much too busy trying to keep the butterfly from escaping to reign them all in. Amanda remained in her corner, but her wide-set brown eyes were big with hope. She sat up straight in her chair, arching her neck, straining to see past the crowds of other children. She was obedient always, mostly because it was the easiest way to keep from talking. But then suddenly she was knocked forward, hitting her forehead on the table. 'I want to see!' yelled the boy who had elbowed Amanda in the back. He surged into the pool of bodies, grunting his way to the front. Tears sprang into Amanda's eyes, but no one noticed her in their quest for the butterfly. Her long fingers, covered in orange marker, gingerly touched the bruise forming on her forehead. Tapping. Tapping. Wrinkles of confusion crossed her face, and then she was crying harder. From the center of the kid-whirlpool, Mrs. O'Dell heard the distressed cry. She snapped her head up, cupping the butterfly lightly and protectively between her hands. Amanda was sobbing. Nudging her way through the bedlam, hushing the eager, careless swarm around her, Mrs. O'Dell suddenly appeared in front of Amanda. The rest of the children became quiet, watching to see what would happen to the 'crybaby'. 'What happened, Amanda?' Mrs. O'Dell asked. The girl flinched at the sound of her teacher's voice. The tears stopped, but she kept her hand up near her face, repetitively and gently touching the wound. She had begun rocking slightly, back and forth, biting her lower lip. Her big, dark eyes darted from her teacher's face to her placidly cupped hands. The fear in those eyes hurt Mrs. O'Dell's heart. 'Would you like to see the butterfly, Amanda?' Mrs. O'Dell wanted Amanda to feel included, to be included. And when the child nodded, softly, still cradling her hurt, Mrs. O'Dell held out her hands, smiling. Her large turquoise ring gleamed in the fluorescent classroom light. She opened her palms to reveal the perfectly silent, brilliant gold creature. The butterfly unfolded to receive the fresh air across its broad, bright wings. Amanda instinctively reached towards the animal, and Mrs. O'Dell just as instinctively pulled it away. But when she saw the hurt look spring back into the child's eyes, Mrs. O'Dell changed her mind. The moment the question was asked, breathing stopped in total. Amanda's classmates gasped in envy, waiting to see how she would respond. And Amanda was hesitant, too. So many times before kindness had been offered to her by people she trusted, and then it had been snatched cruelly away. But never had this happened with Mrs. O'Dell. So, Amanda nodded. Mrs. O'Dell stood behind Amanda, embracing her, with her own hands still gently cupped. Amanda was completely focused on the prize she was about to hold. She put out her hands, markered fingers, chewed nails and all. As Mrs. O'Dell unveiled the butterfly, it walked gracefully across her palm and into Amanda's hand. The tiny feet brushed against her skin like eyelashes. A tiny curled tongue slipped out and then back into the butterfly's mouth. Amanda giggled. For an instant there was perfection. Amanda glowed with pride as she handled the butterfly, and the rest of the children watched in awe. She knew this creature. She understood this silent beauty. 'Do you see, class, how long the butterfly has stayed in her open hand? Amanda,' said Mrs. O'Dell softly, 'It likes you.' The rest of the class nodded along. It must be true. The little girl's mouth opened in sincere disbelief. Nobody liked her except, now, this beautiful animal, blinking its wings at her playfully. Someone lunged from the placid sea of young faces, breaking the silence. 'I want a turn!' she demanded. Before anyone could even think, the butterfly tensed, sensing a change in the air. Amanda clasped her hands together, and squeezed. She didn't want the butterfly to fly away. But then they were all screaming at her, tugging at her arms. That was Mrs. O'Dell. She pried Amanda's hands apart. But the butterfly stayed in the left hand, pressed flat, one wing torn. The silence in the room had turned ominous. Amanda screamed. All around her children were crying. Amanda sobbed uncontrollably, keeping her murderous hand extended, locked at the elbow. Mrs. O'Dell was shocked, but moved as a woman with a duty to uphold had to move. She pulled the butterfly off of Amanda's sweaty palm, trying to shut out the fresh wave of tears that came when three little black legs stayed stuck to the child's damp, pale skin. Mrs. O'Dell ordered the children back to their seats, cupping her hands around the body as she moved to her desk. Fourth graders need closure. Mrs. O'Dell fished around in a drawer for a box of paper clips, dumped out the contents, and placed the dead insect inside. They filed out to the planter box single file. The janitor volunteered a small shovel, and the funeral began. The class held hands around the grave and sang 'You Are My Sunshine'. Most of the children hummed along because they didn't know the words. But no one would hold Amanda's hand. She stood, mute, dazed, with her arms hanging heavily and mournfully at her sides, ostracized, a ten-year-old criminal. Later that day, after all the children had gone home, Mrs. O'Dell found a yellow flower on the butterfly's unmarked grave. She pursed her lips, knowing that somewhere there was a little girl feeling more remorse over the death of that insect than anyone could possibly imagine. And the confused, horrified, helpless look on Amanda's face after she had ended the life of the butterfly would haunt Mrs. O'Dell forever. What had happened that day would never be understood by anyone, least of all the poor silent creature who had done the killing.